What is the Grange? How many times have you been asked this question? Wouldn't it be easier to just say, We are many things, but to help you find out about our family organization I would like to give you this brochure about the activities of our Grange. If you have any additional questions, please give me a call. My phone number is: 203-272-4620. If the State Grange were to print up a general brochure, it would not meet the needs of each individual Grange in the State. Each Subordinate Grange should consider compiling such a brochure. Your Information/Publicity Committee should make a list of the activities and projects the Grange is doing throughout the year. They should also list the names of the officers as well as some background information. One of your members with a computer could be enlisted to print-out the brochure. The finished brochures could then be given to the Public Library, the Town Hall or to the Welcome Wagon and the Newcomers Club. Each Grange should also keep a supply on hand to distribute during public events throughout the year. 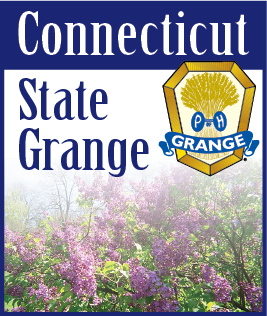 If your Grange needs assistance in preparing your brochure, members of the State Grange's Information/Publicity Committee will assist you. Just give us a call.